As the current pet food recall has millions of pet lovers scrambling to find safe, healthy diets for their dogs and cats, lies, myths and misconceptions perpetuated by pet food manufacturers, vendors and misinformed spokespeople continue to endanger pets. Dr. Jean Hofve, nationally-renowned pet food and nutrition expert, and Jan Rasmusen, winner of two national awards for her book, Scared Poopless: The Straight Scoop on Dog Care, reveal dangerous lies and important truths in three new low-cost recordings on how to safely feed your dog or cat. Dry food is associated with many serious chronic health conditions and is not recommended as a regular diet. As the current pet food recall has millions of pet lovers scrambling to find safe, healthy diets for their dogs and cats, lies and misinformation perpetuated by pet food manufacturers, vendors and uninformed spokespeople continue to endanger our pets. Dr. Jean Hofve, nationally-renowned pet food and nutrition expert, and Jan Rasmusen, winner of two national awards for her book, Scared Poopless: The Straight Scoop on Dog, reveal dangerous lies and important truths in three new low-cost recordings on how to safely feed your dog or cat. Lie #1: Vets are nutrition experts. Most veterinarians are general practitioners with only minimal nutrition education. Much of what they know comes directly or indirectly from the pet food industry. Most of them sell processed food products and have little or no experience with homemade diets. Lie #2: Kibble is safer than canned. 75% of past pet food recalls involved kibble, and dry foods are being added to the current recall list. Dr. Hofve says: "Dry food is associated with many serious chronic health conditions and is not recommended as a regular diet." Furthermore, contrary to popular belief, kibble does NOT clean a pet's teeth. Lie #3: "People food" is bad for dogs and cats. 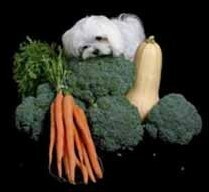 If you eat a reasonably healthy diet yourself, with a little education you can feed a healthy diet to your cat or dog. In fact, just as is true for humans, fresh foods can provide much better nutrition for pets than highly processed "fast foods" Make no mistake: pet foods are fast foods. Lie #4: Natural = safe and Human Grade = superior quality. Many people mistakenly believe that "natural" foods are "safe." Not true. Arsenic is natural, but nobody argues its safety. And whereas food fit for human consumption is preferable to the leftovers and waste products in most pet food, there is no legal or even practical definition of the term "human grade." This is strictly a marketing term and is often abused. Lie #5: Foods not on recall lists, and food with "safe" date stamps ,are safe. Consumers are reporting sickness and death from acute renal failure in pets far earlier than the recall dates -- at least as far back as last summer. As more and more foods are recalled, "safe" becomes an unclear term. Lie #6: "Complete and balanced" foods are complete and balanced. Commercial foods lack many essential elements, often contain condemned ingredients, and most lack some or all of the four essentials that will keep your pet healthy: probiotics, digestive enzymes, green foods and essential fatty acids. Lie #7: Raw food diets are dangerous. So-called BARF diets (Biologically Appropriate Raw Food) resemble a dog or cat's natural diet and can be superior to all other diets for many animals when fed by an educated "chef." Food, of course, must be fresh and properly handled. Also, "raw" is no guarantee of quality and any raw food may challenge an ill pet. For more information on feeding myths and a witty dog's look at what really goes into pet food, read a chapter excerpt from Scared Poopless. What the Heck Do You Feed Them Now? From Mere Survival to Optimum Health. Dr. Jean Hofve, veterinarian, former Editor-in-Chief of the Journal of the American Holistic Veterinary Medical Association, has researched pet food and pet nutrition for more than a dozen years. A practicing veterinarian and four-term President of the Rocky Mountain Holistic Veterinary Medical Association, she worked two years as a full-time animal advocate for the Animal Protection Institute where she was a liaison to AAFCO, the organization setting standards for the pet food industry. Jan Rasmusen is the author of Scared Poopless: The Straight Scoop on Dog Care. Jan's book is the WINNER of the Ben Franklin Award for the Best Health Book of any kind, the WINNER of the USABookNews Award for the Best Pet Health Book and a finalist for the Dog Writers Association of America: Best Care and Health Book. It is recommended by Animal Wellness Magazine, the Animal Protection Institute, actress/activist Betty White and countless veterinarians. Contact Dr. Hofve at http://www.LittleBigCat.com for interviews. Contact Jan Rasmusen at http://www.dogs4dogs.com/mediaroom.html for interviews or review copies, and to view TV clips at her on-line Media Room. Short-notice interviews are welcomed by both experts.